Hama has launched a new Wi-Fi data reader for all Apple devices running iOS 5 or later. This data reader enables you to transfer data from SD cards or USB sticks to your iPad or iPhone over Wi-Fi, without using iTunes. 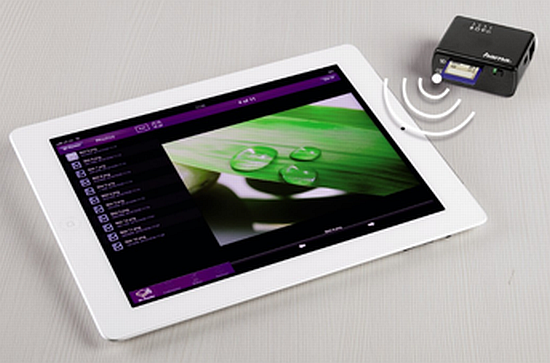 The Hama Wi-Fi data reader supports all standard USB sticks and SD, SDHC and SDXD memory cards. The required Wi-Fi reader app can be downloaded from the iTunes App Store free of charge. Your vacation was divine, and the pictures on your camera came out great – but how do you get them onto devices like the iPad, which doesn’t have a USB port or a card slot? With Hama’s new Wi-Fi data reader for all Apple devices with the iOS 5 operating system or later, it’s no problem. This data reader enables you to transfer data from SD cards or USB sticks to your iPhone, without using iTunes. What’s more, you can use it as a simple Wi-Fi repeater or router If the data reader is connected to the network by cable, up to five mobile devices can establish an Internet connection via WLAN. This is especially convenient if your hotel room only has a LAN connection, but your iPad and iPhone need WLAN. The bridge mode provides simultaneous access to the Internet and your data. The data reader supports all standard USB sticks and SD, SDHC and SDXD memory cards. With the right adapter, it also supports all microSD models. When switched off, the data reader acts as an ordinary card reader. The required Wi-Fi reader app can be downloaded for free in the Apple Store.